Here comes her favourite dish, chicken wings in lemon and ginger sauce. The taste of this dish that is mainly sweet & sour, blended with the heat of ginger makes the chicken wings irresistible. It seems that chicken wings won’t be enough whenever they are cooked for my family. My daughter is a chicken wing lover. As it’s quite easy to cook and there are many different ways of cooking chicken wings, I love cooking for her. I think I have to double the size if I cook this dish again. While eating the wings, my daughter asked me why I hadn’t cooked more. The quantity listed here was not even enough for her, let alone for the whole family. Huh…. It's very easy to make this dish. Brown the marinated chicken wings first. Mix in the seasonings. And cook for a while. The chicken wings are good to go to be served on your dining table. Cut chicken wings into chunks, and stir in marinade. Set aside for 30 minutes. Heat frying pan with oil over medium heat. 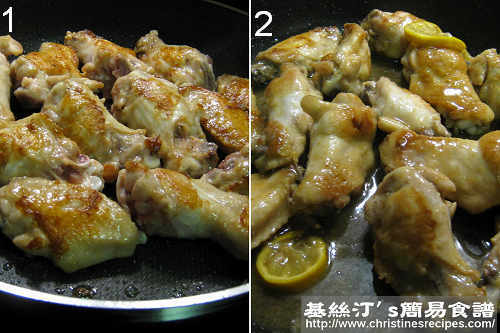 Fry chicken wings until both sides are brown. Add grated ginger, cover and cook for a while. Once there are some steam release, cook 2 to 3 minutes more to make sure the chicken wings are cooked through. Stir in the seasonings and lemon slices, combine with the chicken wings. Cook until sauce dries up a bit. Dish up. Serve hot. I really like the sauce in this recipe. It's light and putting fresh lemon in it really makes a difference. I would even double the recipe next time so that I can have enough sauce for rice too. Thanks! i am i first time visiter n am impressed. see my blog on healthy food. The chicken looks yummy and I'm thinking about trying next weekend. Quick question, you mentioned sweet and sour in the post, but I don't see any sugar in the seasoning or marinade, so it this meant to be sweet at all? Thanks! Yeah, this dish is really attractive and yummy. 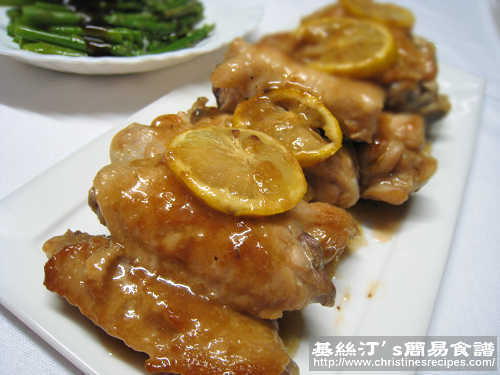 I used honey in seasoning instead of sugar to blend with the sour taste of lemon, making the sauce quite special. You can adjust the amount of honey to your preference. hI, Christen. thanks so much for this recipe which i cooked today and it came out so nice. so easy to prepare too! want to ask you if i can freeze them. thanks again. Ginger would go really well with chicken wings. Worth trying. Sure, you can freeze them if you can't finish them all at once. It's better to finish them as soon as possible because the lemon juice won't be good for a longer time. Just wondering how to increase the ingredients quantity if I would like to prepare for about 12 person in my family? It's pretty straight forward. You can double or triple the amount of all the ingredients, depending on how hungry the 12 people are. good recipe. going to try it. looks good! Hi Christine, what is garlic salt? Any close substitute? Is this recipe suitable for picnic? Thanks! Garlic salt is a kind of seasonings, available at supermarkets. You may use garlic and salt instead. I reckon any chicken wings will be suitable for picnic.